U2's Bono has hailed the "undefeatable spirit" of Manchester following a deadly terrorist attack in the U.K. city. Suicide bomber Salman Abedi detonated a device in the foyer of Manchester Arena as crowds were leaving an Ariana Grande concert on Monday evening (May 22), killing 22 people and injuring 64. Three more people were arrested in connection with the attack on Wednesday, as troops were deployed onto the streets of the U.K. after the government raised the terrorist threat level to critical for the first time since July 2007. 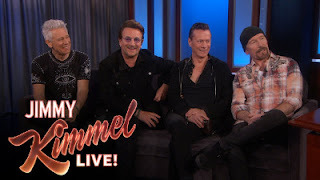 The Irish rock band made an appearance on Jimmy Kimmel Live! on Tuesday night, and frontman Bono took the time to express his contempt for the bomber and support for the local people in the wake of the tragedy. "They hate music, they hate women, they even hate little girls," he said. "They hate everything that we love. And, you know, the worst of humanity was viewed in Manchester last night. And so was the best as people took perfect strangers into their hands and queued up for blood banks. Manchester has an undefeatable spirit, I can assure you." Later in the show, U2 surprised the audience with a performance of their 1987 hit song Still Haven't Found What I'm Looking For, where they were accompanied by a gospel choir. U2, which is comprised of Bono, The Edge, Adam Clayton and Larry Mullen Jr., are currently on the North America leg of their Joshua Tree 30th anniversary tour. The band also performed their new song, The Little Things That Give You Away. The group also confirmed that they had made their next album Songs of Experience, but were hesitant to announce a release date. "It will be out, definitely within the next 27 years," joked guitarist The Edge. "There's a lot of work to be done."